The WMIPEA1024 series of AC DC power supplies provides up to 36 Watts of continuous output power in a 2.9” x 1.69” x 1.28” package. All models have a single output and a wide input voltage range of 100~240VAC. This series is RoHS compliant and meets CEC Level V, VI requirements. This series also has UL/cUL 60950, CB, CCC, FCC, and CE safety approvals. All models are protected against short circuit and over voltage conditions. 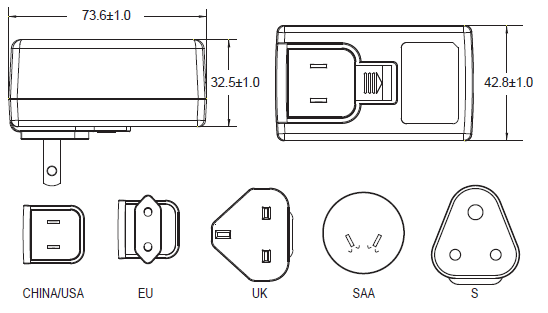 Six interchangeable AC plugs are available for this series: USA, China, EU, UK, SAA, and South Africa. Please call factory for ordering details.